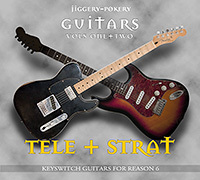 Now updated for the latest RE amp simulations, JP presents a pair of high quality, key-switching guitar ReFills for Reason 6+, Volumes 1 and 2, Stratocaster and Telecaster are currently available. Purchase both products together for a discount, available at the bottom of this page, or via the Multi-ReFill Offers page. Download the free updated Patchbank here! For nearly 60 years the bright tones of the Fender Stratocaster have been the go-to electric guitar sound for thousands of guitarists. 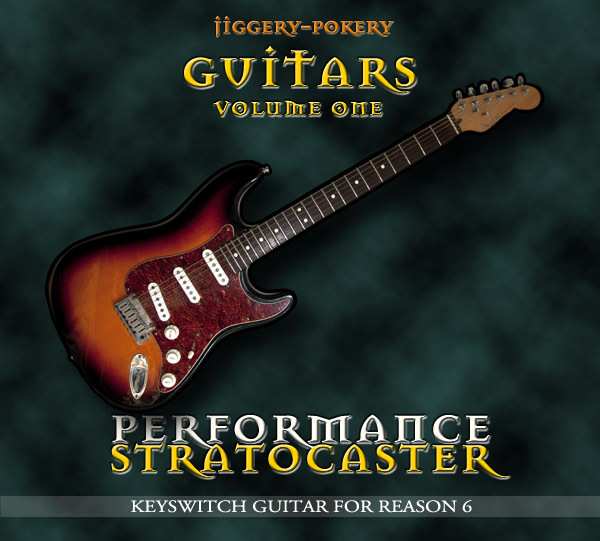 Now, in a guitar-Filled first for Reason 6, JP presents a stunning, keyswitch-enabled Stratocaster set, in pristine 24-bit, to sit right alongside the Propellerhead Studio Combo range. 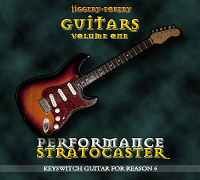 The guitar sampled for the Performance Stratocaster ReFill is a 1994 Fender Stratocaster, featuring a two-piece alder body, maple headstock with rosewood fretboard and a single-coil pick-up, for an original Strat sound. Every note of every fret was recorded, and were made at a bit depth and samplerate of 24/88.2 with a direct low-noise mic-level input and then downsampled to 24/44.1. The zip file contains both 24-bit and 16-bit versions of the ReFill. 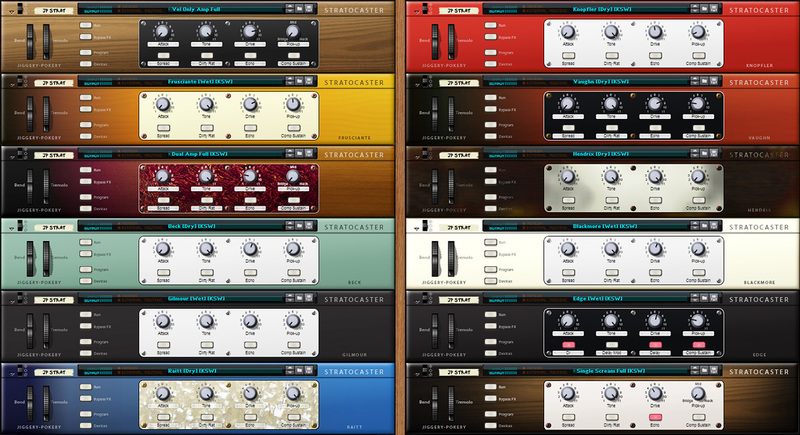 Designed with amp modelling in mind, the "keytar" Combinators come in a variety of flavours, dual or single amp, Line6 Amp or Scream 4, full patches or reduced sample-sets, plus 10 special setups inspired by some famous users, including Hendrix, Frusciante, Raitt and Gilmour, in amp-only or "wet" with Line 6 FX chains based on some of their setups. With over 50 of these brand new Line 6 PodFarm patches, plus 170 L6 tones from previous JP releases and a further 40 esoteric, experimental or alternative performance mapped Combinators you'll soon find your own signature Strat sound. The ReFill comes complete with a detailed PDF, including the full FX chains modelled in the "signature" setups. 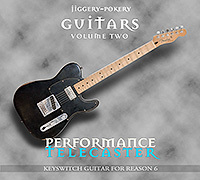 Download the updated version of Jiggery-Pokery Guitar Chords for Reason 6, which has been fixed so that all note-offs are now at the same time from this page here. Everything in its own place by The Quixotes. One great guitar, three amazing tones: It’s the Tele. Multi-sampled. For Reason. Extensive multi-sampling for all three pick-up positions of a 2010 Telecaster: ’59 SD Humbucker (dual-coil) for a deep woody tone, TM Single Coil for leads with some classic Tele “twang”, and Mid, both pick-ups for a full range tone. Whether playing lead or rhythm, choose from Single Pick-up Combinators, or go super-size and try the Triple Pick-Up Combinators and switch between all three pick-up positions whenever you need. For the heavy rockers and punks out there, a massive suite of power chords (root+fifth) on the Low E/A, A/D and D/G strings (20 multi-velocity power chords per string, per pick-up), keyboard mapped for two hand strumming. Switch between sustained and palm-muted power chords on-the-fly, and use key-switching to add up or down power-slides. All power chords and slides feature per-note samples, and the sustained and palm-mutes feature Alt velocity maps with timing variances. One octave of blues chords (maj, maj7, m, m7), keyboard mapped for one hand down/upstroke strumming, with mute slap keyswitch. Choose from a variety of key-switches and string mappings, multi-velocity lead sustained, hammer-on and palm-muted tones, plus slide up or down 1, 2, 7 and 12 semitones, with up to eight different NN-XT string mappings to favour higher or lower strings. 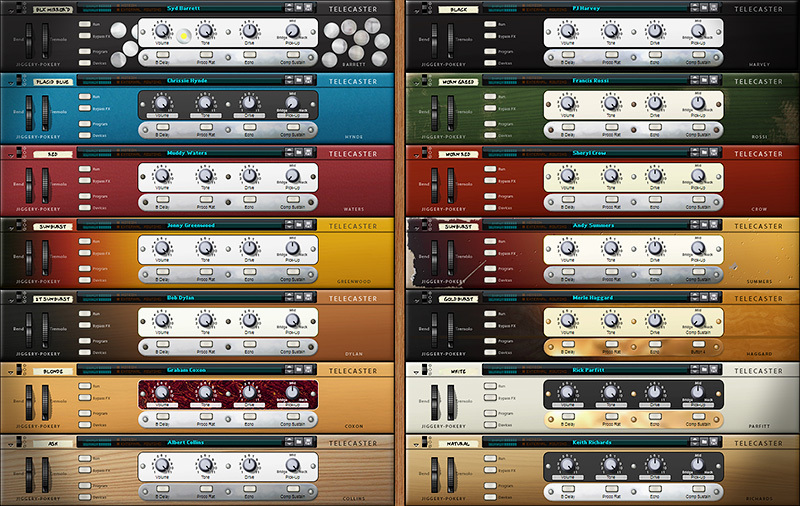 Individually mix fret slide noise, pick-noise, release noise and release resonance. Fifteen more rigs inspired by some famous Tele users, including Syd Barrett, Muddy Waters, Graham Coxon, Chrissie Hynde, Albert Collins, PJ Harvey, Bob Dylan, Quo (Rossi/Parfitt), plus exclusive new JP rig patches, including high-gain monsters for your power chords! There are 124 Combinator setups covering rhythm and lead tones and esoteric patches such as Talkboxes, and separate string Combis, all set to play with Mod (Tremolo), Sustain+Expression (Wah) and Aftertouch (Vibrato), with an additional 121 “Light” versions of the full Combinators for reduced memory footprint. Please note due to the size of the some of the patches only the 16-bit version is commercially available. Oxygene Blues by JM Jarre, arr. The Quixotes. Tele patches: "Every Breath You Take", "Keep the Plates Spinning" and "Humbuckminster Fullerene"